David Byrne's bike racks are part of the Cityracks program which provides free sidewalk racks for short-term bike parking. With limited sidewalk space and heavy footfall, many of New York's streets suffer from sidewalk congestion. 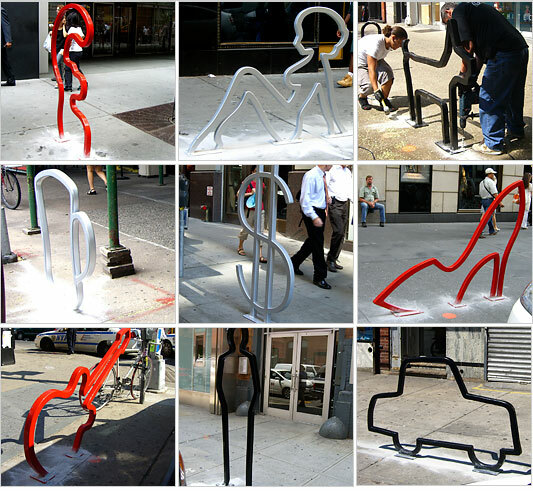 There was also a successful design competition for new bike racks that compliment New York's sought-after new image of a cycling city. Summer Streets is another initiative which closed off a 6.9 mile north-south route for six hours on three consecutive Saturdays last summer. All these initiatives are part of 'plaNYC' which is featured in a previous post about Jan Gehl Architects. David Byrne cycles with Wall Street Journal's Reed Albergotti to visit the Brooklyn metalworks where his bicycle racks are being fabricated.